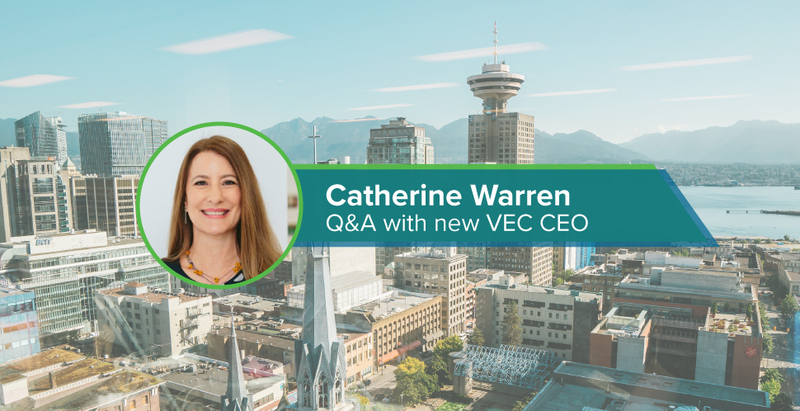 The Vancouver Economic Commission (VEC) is pleased to welcome entrepreneur, changemaker and digital media powerhouse Catherine Warren as our new Chief Executive Officer. She brings an illustrious, three-decade career spanning digital entertainment and tech, community development and placemaking, as well as a deep industry network and a record of longstanding service to the international media sector. We are fortunate to have engaged her expertise, interest and visionary leadership for the VEC. Naturally, we had plenty of questions for Catherine during her first two weeks, and we’re eager to share some of her responses with you. Q: What drew you to this CEO role? Catherine: Vancouver is a place that values people and creative thinking – a place known around the world for sustainable and digital leadership. These are my values and interests too, so this is a great place to be. Joining VEC right now, when the world needs more Vancouver and when Vancouver is eager to collaborate globally, is a dream appointment. At VEC we get to work within our community – in a city where I also feel fortunate to have grown up – and to make a difference here and internationally. So, you could say being here is organic. Q: What are you looking forward to in your first month? Catherine: I’m really enjoying getting to know VEC’s team and board from a front-row seat after relying on the organization’s research and depending on VEC’s publications for my previous work in international business and local placemaking. I’m looking forward to reconnecting with colleagues that I’ve worked with over the years, many of them already VEC’s stakeholders, and exploring what we can do together to advance prosperity across our region. And I’m excited to brand Vancouver to the world more formally after enjoying being an informal ambassador throughout my career. Q: What are some of your top opportunities for economic development? In the weeks ahead, we’ll have more questions, and imagine you will too. We encourage you to reach out with your questions and ideas as we keep this conversation going. Read more about Catherine’s appointment in our news release. Follow her on Twitter at @VanEconomicCEO.